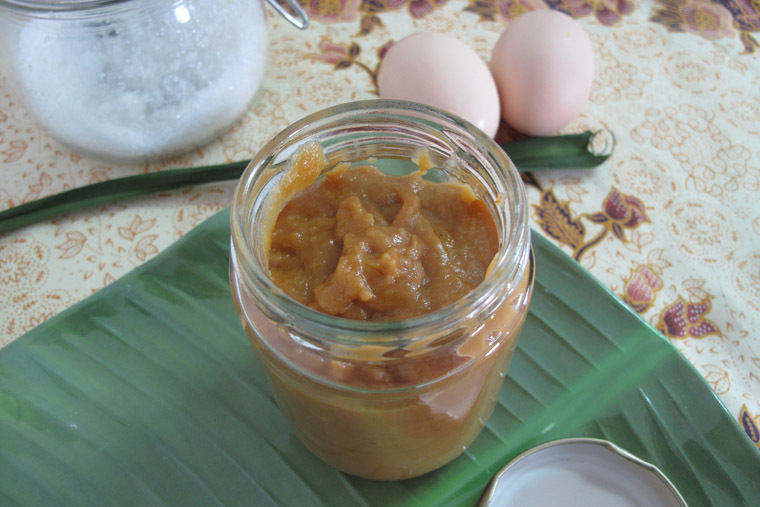 If you’re looking for the authentic recipe for kaya jam, this is not the one. However, if you’re looking for the easiest and fastest way to make Malaysian favourite spread, you’re at the right place. Much to my chagrin, traditional way to make kaya takes about two hours. I’m so glad to find a simple recipe from Kitchen Tigress which reduces the total cooking time down to 15 minutes. And only five ingredients are needed. It cannot get easier than this! Step 1 Whisk egg yolks and set aside. Step 2 Pour coconut milk and palm sugar in a saucepan. Step 3 Melt palm sugar on low heat. Stir throughout. Step 4 Add pandan leaves and 3 tbsp sugar into the pot. Cook on high heat. Stir until sugar melts and coconut milk bubbles. Step 5 Turn down the heat. Pour coconut mixture into whisked egg yolks slowly and whisk them at the same time. Step 6 Then, pour the mixture back into the pot. Let is simmer and stir throughout. The solution will thicken. It should take about 10 minutes. If it’s not sweet enough, you can add more sugar. Step 7 Discard pandan leaves with a pair of chopstick and tongs. The kaya would be sticking on the leaves, remove them with chopsticks. Step 8 Transfer to a bottle. Let cool, cover and refrigerate. It should keep up to a week or longer. 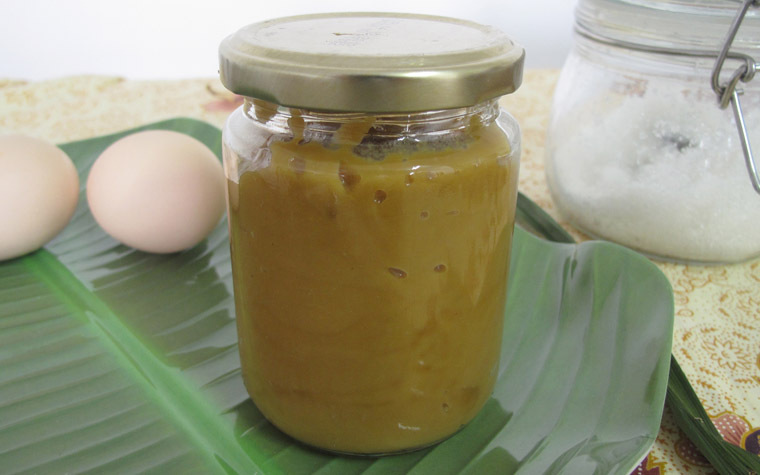 Melt 45 g palm sugar in 200 ml coconut milk on low fire. 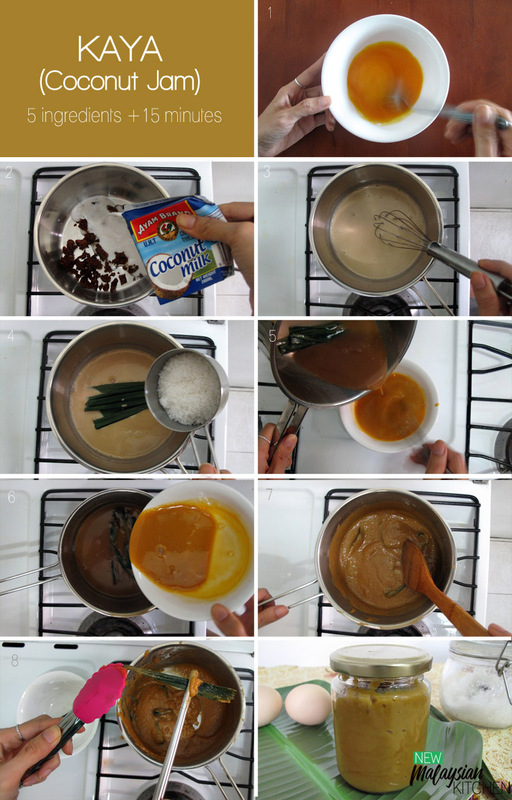 Add 4 cut pandan leaves (2 in) + 3 tbsp sugar. Cook on high heat sugar melts & coconut milk bubbles. 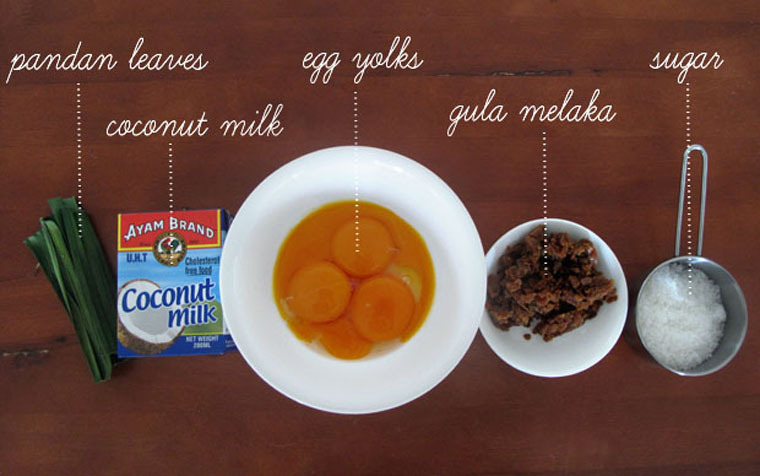 Pour coconut mixture into a bowl of whisked egg yolks slowly, whisk at the same time Pour mixture back into the pot. Simmer & stir until thicken (10 min). Discard leaves. Cool & transfer to a bottle. Fresh coconut milk (santan) It’s best to get fresh and thick coconut milk. However, if you can’t get hold of it, packet coconut milk will do. Store for a week. It’s best to finish within a week. However, I find that I can keep it longer than that and it still taste good. 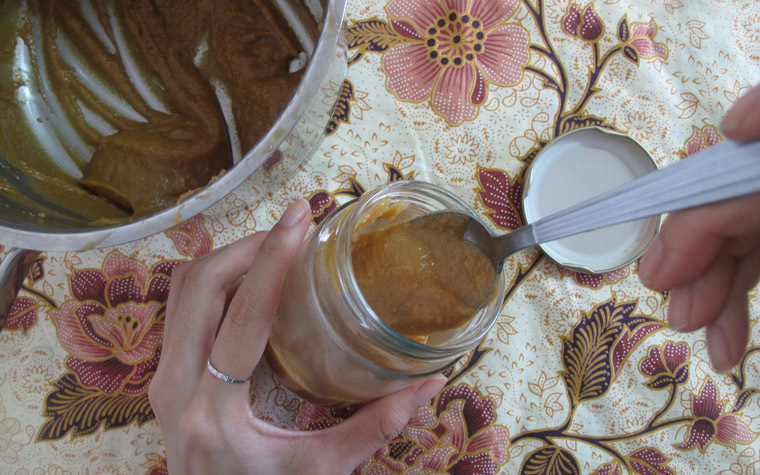 Longer storage Always use a clean spoon/knife with no trace of water to handle kaya jam. This ensures that the jam last longer. Spread your homemade coconut jam and butter on hot, toasted bread. Enjoy! I believe that eating healthy is eating traditionally. I cook with fresh ingredients & natural seasonings. To keep up with our busy lifestyle, I enhance classic recipes using science & modern appliances to create easy, healthy & tasty meals.